Microblading, also known by a variety of names such as Hairstrokes, 3D Brows, Eyebrow Embroidery, Microstroking, Feather Touch and hair like strokes is a form of permanent makeup that provides a means to partially or fully camouflage missing eyebrow hair with the appearance of simulated hair using fine deposits of cosmetic tattoo pigments. The technique of implanting pigment after the creation of fine incisions in the skin may date back thousands of years however the trend towards using the technique for eyebrows may have emerged in Asia in recent years. ​Contact us today in Merrimack, NH. ​Microblading is performed by manually depositing pigment superficially in the upper region of the dermis with the use of a hand tool with attached needles fused together in a linear grouping, it does not involve the use of a machine. 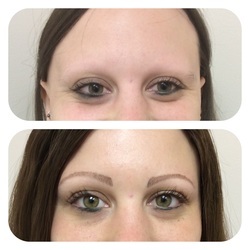 Similar to permanent makeup brow treatments using a machine, the Microblading technique involves drawing individual, crisp hair strokes that can be very natural looking but nonetheless Microblading is still a form of cosmetic tattooing. The microblading needle groupings tend to contain needles that are extremely fine in diameter in comparison to the needles used in traditional tattooing however recent advancements in cosmetic tattoo needle technology has also produced extremely fine needles gauges for machine use. Technicians usually use a numbing solution to limit discomfort and consequently like all forms of cosmetic tattooing if performed correctly the procedure causes minimal discomfort.